This Celtic cross ornament is made in Ireland by Liffey Artefacts. 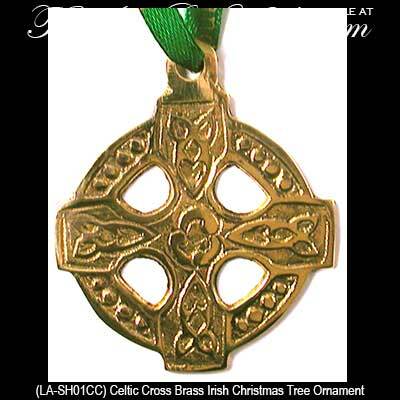 This Celtic cross Christmas ornament is made of brass and features a double sided dimensional design that includes Trinity knots. The Irish ornament is ready to hand with an included ribbon and measures 2” wide x 2 3/8” tall. The Irish Christmas ornament is gift boxed with Celtic knot and Celtic cross history cards, complements of The Irish Gift House.